Waller WH. Galactic and Extragalactic Astronomy: an Introduction: William H. Waller Ph.D.. The Galactic Inquirer. 2013 May 29 [last modified: 2015 Jul 31]. Edition 1. If you look skyward on a clear moonless night, you can immediately see that you and all of your fellow Earthlings live in a galaxian universe. Indeed, almost all of the celestial objects that you can see with your unaided eye reside within the Milky Way – our galactic home. From pin-point stars of multiple hues to hazy nebulae and silhouetting dust clouds, the myriad denizens of our Galaxy collectively trace a vast self-gravitating system that whirls about the supermassive black hole in its center while percolating in continual self-transformation. Photomosaic of the entire sky at optical wavelengths showing the stellar and nebular disk of the Milky Way Galaxy across the middle, the Large and Small Magellanic Clouds to the lower right, and the Andromeda Galaxy which appears as a small lens-like object to the lower left. Image courtesy of Axel Mellinger (see http://home.arcor-online.de/axel.mellinger/mwpan_aitoff.html). Just beyond the Milky Way, the Large and Small Magellanic Clouds can be readily spotted from the Earth’s southern hemisphere. These companions (or victims) of the much larger Milky Way are but the biggest and brightest of the 15-odd galaxies that are currently known to be buzzing around us. Residents of Earth’s northern hemisphere who can get away from sources of light pollution can enjoy naked-eye and binocular views of the more distant Andromeda Galaxy. Similar in girth to the ponderous Milky Way, the “Great Nebula in Andromeda” rules over its own bevy of dwarf satellites some 2.5 million light-years away from our home system. Messier 81, also known as Bode’s galaxy, is a nearly face-on classic spiral, located in the constellation Ursa Major. It is the largest of the eponymous group of 34 galaxies, with a diameter of 92,000 light years. 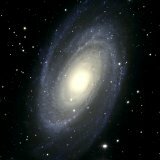 At a distance of 12 million light years, M81 is one of the closest galaxies outside of the local group. The galaxy has a 70 million solar mass supermassive black hole at its center. Image courtesy of Mario Motta. 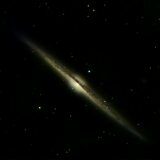 NGC4565, also known as the needle galaxy, is an edge-on galaxy in the constellation Coma Berenices. The galaxy has a clearly visible central bulge and dust lane, and is a favorite of amateur astronomers. NGC4565 lies about 40 million light years away, and spans some 100,000 light years across. Image courtesy of Mario Motta. Amateur telescopes can reveal thousands of other galaxies in those sections of the sky that are sufficiently far from the Milky Way’s congested disk. The digital images of elliptical, spiral, irregular, and interacting galaxies that these “citizen scientists” can now obtain surpass the best images obtained professionally just 25 years ago. Beginning in 1995, the Hubble Space Telescope was trained on seemingly empty patches of the sky for exceptionally long exposures lasting 10 or more hours each. The resulting Hubble Deep Fields in the northern and southern hemispheres and the more recent Hubble Ultra Deep Fields have shown galaxies upon galaxies to the edge of detectability. 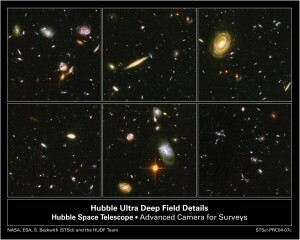 Zoomed portions of the Hubble Ultra Deep Field showing galaxies of all kinds. The most distant galaxies appear very small, irregular, and red – their light waves having been stretched to red wavelengths by the expansion of the intervening universe. Image courtesy of Steven Beckwith (Space Telescope Science Institute), the Hubble Ultra-Deep Field Team, NASA and the European Space Agency (http://hubblesite.org/newscenter/archive/releases/2004/07/image/c/). In these images, we can behold galaxies so distant that we see them as they were more than 10 billion years ago – shortly after they had formed from the chaos of the Hot Big Bang. Looking locally, we can see that our home galaxy has evolved to the point where sentient life has overrun the moist surface of one rocky planet that is in orbit around one particular but unremarkable star. We are left wondering how all this played out. 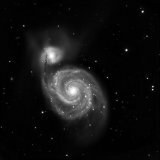 Indeed, understanding the structure, content, and natural histories of these diverse realms has challenged our best astronomical minds while motivating the development of ever more powerful telescopes and sensitive instrumentation. In many ways, our galaxian adventures have just begun. One of the key missions of The Galactic Inquirer is to support publicly-accessible communications in galactic and extragalactic astronomy. We welcome non-technical articles, commentaries, profiles, and photo-essays that are well-crafted and engaging. You can contact us using our Contact form, available in the main menu. All submissions should include the names and e-mail addresses of all authors along with a picture of the author(s). The author(s) should state their status as a student or professional as part of a 1-3 sentence biography. Great website and great project. I look forward to more! When I start thinking about astronomy of any sort, I usually am in a mood that reflects some semblance as being balanced, that is, at peace with myself and my visible surroundings. (Usually). Than, the further I read or watch or hear, I imagine all of the huge galaxies, of sizes and distances I cannot imagine, my quasi-contented ness state begins to break down. The sheer magnitude of what I am beholding is too much- it overloads my system. There are things we have not discovered in the thing we call our universe- and maybe even life, as intelligent (or lack thereof) as we on Earth. What baffles me most, the complacent human that I am, that this is far beyond my control or current understanding. Further, that my whole existence is beyond my control, how I, and by extension, the whole planet, galaxy, and this universe came to be. And after I take a step back, perhaps what even more challenges my humble human brain is that that I evolved to be begin to understand, and sit here on an iPad typing in, this universe, all of which occurred beyond my control. Pretty good for being a humble human, eh? Whenever I Elgin to think about astronomy, such as I did when I perused this article, I normally come to the subject with a pretty balanced state of mind, knowing who I am anywhere I came from. Etc. 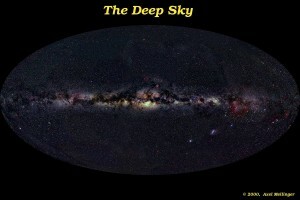 However, as I begin to delve deeper into the analyzed part of the Universe, those. Barriers that I had felt comfortable I before begin to break down. The sheer size and distance that this mysterious things are away from us on Earth, and that we have a connection with them, being formed in the beginning of time in the Big Bang. And what further overloads my system, is that I on earth have evolved to be able to make sense of and analyze these far-reaching surroundings of mine. Perhaps, too, what baffles me most out of all of this, is that I have arrived in this moment, on this device, thinking about the origins of my existence, via evolution from a big explosion, without having been in control. Perhaps one greater lesson astronomy can teach us, is that we never have been, aren’t, and most likely won’t, be in control. Briefly in the article you mentioned how redshift occurred due to the expansion of the universe. How exactly does this occur? Could it be though of as, say, baking a chocolate chip cookie, where the increasing distance between each chip is the result of the expansion of the dough except our galaxy is one chocolate chip and all the galaxies we see in the night sky are all the other chips, with something (dark matter?) in between acting as the dough, causing the expansion? Or could it be thought of as dots on a piece of graph paper, where the area of whole paper increasing, the area of square is increasing at same rate as each other, but the area of the dots remaining constant with the dots as galaxies and the paper as space-time itself? Or are neither analogies correct or do we just not know? You are spot-on in thinking of various spaces expanding, with embedded objects going along for the ride. Chocolate chips in an expanding cake or dots on a piece of expanding graph paper all serve as handy analogues for our expanding universe. In each of these analogies, the farther the object is from the observer, the greater will be its recession from us. Hubble’s Law formalizes this effect, whereby an object’s recession “velocity” is proportional to its distance — with the constant of proportionality being the Hubble constant. In one teacher workshop that I helped organize, one teacher built a “loom” made of spandex with “galaxies” at the intersections of the “warp” and “woof.” She then stretched the loom and thus showed the corresponding Hubble expansion of the galaxies.